Atlantic Commercial Group, Inc. - Commercial Real Estate - South Florida - Online shopping led by Amazon hit a new milestone in February. The total market share of "non-store," or online U.S. retail sales was higher than general sales for the first time in history, according to a report from the Commerce Department this week. The online sector, referred to as "clicks," has been slowly eating up market share in the past two decades. Its total rose from below 5 percent in the late 1990s, to about 12 percent in 2019, according to the Commerce Department. In February, online sales narrowly beat brick-and-mortar, or "bricks." Non-store retail sales last month accounted for 11.813 percent of the total, compared with 11.807 percent for general merchandise. 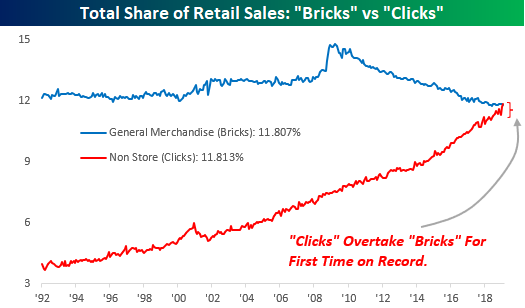 To be sure, brick-and-mortar sales are higher when including other categories such as auto and restaurant sales. E-commerce behemoth Amazon has been a major enabler of the switch to online.